Who says you and your BFF can't launch a stylish sneak blaster attack? 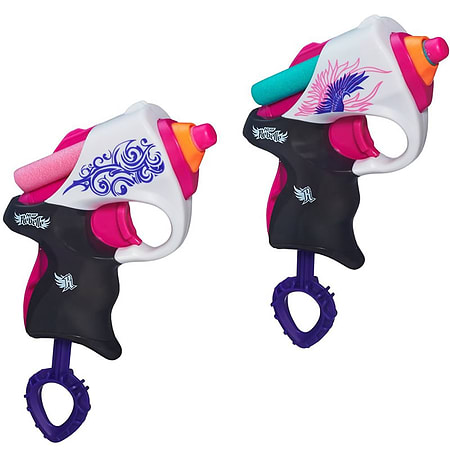 Arm yourself and a friend with the 2 blasters in the Power Pair pack! Each of these stealth compact blasters can fit in a pocket or purse, and launches darts at your targets. Load a dart and pull down the handle, then pull the trigger for a sassy blast! You can give one to a friend or launch a twin attack, but either way you're armed for action with the Power Pair pack! Box Contains 2 blasters and 4 darts.